Frances Colman won her class with an impressive six wins from seven games at Hurlingham this past long weekend. She dropped her first game against Watford's Andre Michel but bounced back for a winning run that culminated in a single point victory over fellow PCC member Peter Haydon. That last win made all the difference and Colman took the class by one clear win from Michel in second place. Colman has now won on her last two visits to Hurlingham and is building on her collection of prize cut glass goblets! Raghu Iyer's PCC 'C' team travelled all the way to Winchester CC to record another good win in the SCF GC Handicap League where they beat Basingstoke today. The match results sheet is yet to be submitted but it it understood that Delia Norris was the star turn in this match, winning both her singles games. Huge thanks to Roger Goldring for coming into the team at short notice. PCC 'C': Roger Goldring (1), Raghu Iyer (6, captain), Delia Norris (6), Dianne Browne (6). Phyllis Court crashed-out of the National Second Tier Inter-Club 'Murphy Shield' Competition at Hamptworth today. Peter Haydon and Raymond Wood won their morning doubles match but the hosts got the better of the singles matches with Hugh Crook and Raghu Iyer. In the afternoon, Hamptworth turned the screw and won the fixture with three more singles victories, leaving Peter Haydon's singles rubber unfinished tied a one game all. The final score as 5.5 to 1.5 in Hamptworth's favour. PCC 'Murphy Shield': Peter Haydon (2), Raymond Wood (3), Hugh Crook (4), Raghu Iyer (6). Phyllis Court 'B' are still looking for their first win of the season having lost narrowly at Blewbury today. 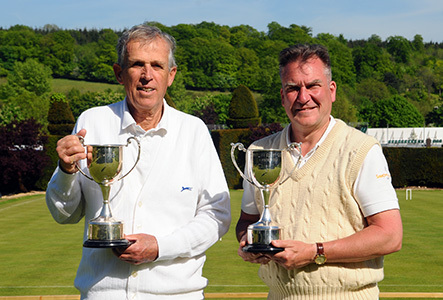 There will be two new names on the Barnses Cup as Peter Haydon and Robin Coates won their respective Senior and Junior AC Handicap events in toady's Tournament. The courts were in great shape and the best they have been for at least 10 years with the 'shorter grass and reduced watering' regime that is now being employed, really bearing fruit for croquet players - At last we now have courts on which AC can be played properly, so it's ''hats-off and thank you' to Head Gardener Paul and his staff Henry and Emily. In a change from recent seasons, singles was preferred to doubles at this spring tournament, and a two division split allow participants to play against their peers. The Junior event was played on the smaller court 3, with 14 point game played to a base which gave both sides a number of bisques. Robin Coates beat both Joanna Iyer and Edmund Shirley, impressively finishing the later game within 'time'. In the Senior event, all four players were tied o one win a piece going into the third an final round, where a win for Peter Haydon was enough to give him the nod over fellow twice winner Frances Colman on the 'who beat whom' rule. It was a close run thing at our 'Drawn Partners' tournament today with the 'who beat whom' rule deciding the eventual winners. 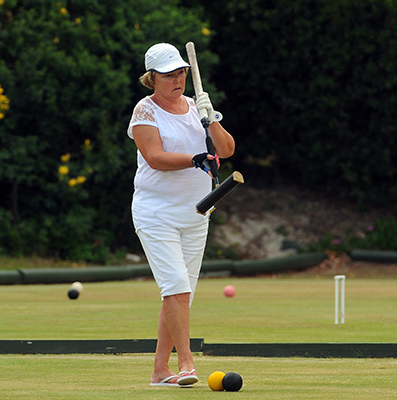 Dianne Browne and Margaret Broughton lead the way undefeated going in to round four but came unstuck against Ralph Chambers and Madeleine Probert. This brought others into contention too, particular Mike Fensome and Diana Zatouroff who were pitted against Chambers and Probert in round five. 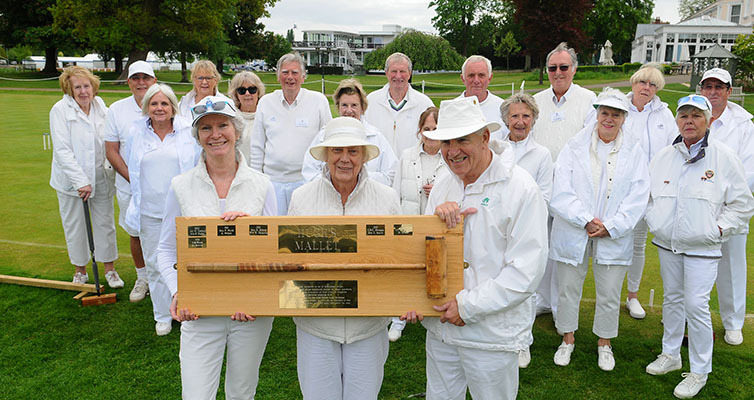 A win for the former would have meant a play-off with Browne and Broughton but when the latter prevailed it was enough to secure them the 'Hugh's Mallet' trophy without further ado. Manager Frances Colman asked long standing member Eva Church to make the presentation and it was nice that all the players stayed until the end to congratulate the winners. 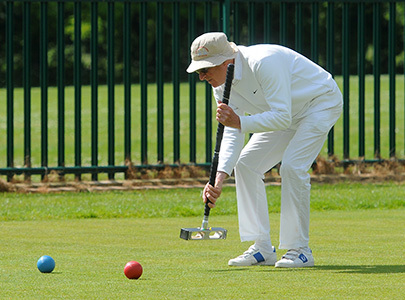 'Our' Richard Peperell (right) had a great weekend at High Wycombe CC with victory in their second CA listed Association Croquet handicap tournament this weekend. Richard, who is Chairman at HW, was undefeated after four rounds and could not be caught going into the final round of five and so his victory was very well deserved. He was in the driving seat in that last game as well but his opponent came back at the 'death' to squeak a narrow result, which was a shame because he had played some of his best AC so far and he deserved a 100% return. Robin Coates (left) had a dream start to his League team career today when he won both his singles matches, and one of his doubles, as PCC 'C’ chalked up another victory. That is three out of three for PCC 'C' so far and it doesn't get much better than that! Delia Norris captained the team today in place of the sick Raghu Iyer (get well soon matey).and a big thank you to Ralph Chambers for coming into the team at short notice. PCC 'C': Delia Norris (6), Dianne Browne (6), Ralph Chambers (7), Robin Coates (9). Southern Croquet Federation Development Officer Barry Dench was top dog at our inaugural C-Level Singles (for handicap 7+) tournament in the pouring rain today. The day was so wet that play was not possible on the two larger courts after lunch and everyone ws soaked to the skin. PCC's Joanna Iyer and Robin Coates both played very well to reach the semis before meeting their match and both Diana Zatouroff and Steve Morton were others to shine. In the end, Dench beat Michelle Leonard from Kingston Maurwrad (near Dorchester) in a well contested final, and he took home a 'History of Phyllis Court' book that was donated by the main club as a prize. Nine PCC members and seven visitors made up the field which was a nice mix for all and the success of the event, even in such trying circumstances, means that we will definitely be running it again next year. Full results will appear via a button 'here' shortly. Our planned staging of the Restricted 'Cave & Wolfe' Doubles has been postponed. It was due to be taking place on Monday coming, but with only four pairs entered this wasn't enough for a meaningful event. The tournament will be re-staged later in the year when the weather is a bit warmer and perhaps interest will be higher. - Chris Roberts, i/c GC. The students were too good for us today at Oxford University in the SCF Handicap League where Robin Coates' victory in his first 26 point game was the only highlight for our team. Chris Roberts should have beaten his opponent but made two costly errors, while Frances Colman and captain Raghu Iyer fell to two rapid improvers. PC handicap team: Chris Roberts (1), Frances Colman (8), Raghu Iyer (16), Robin Coates (24). who pre-deceased him a couple of years ago. 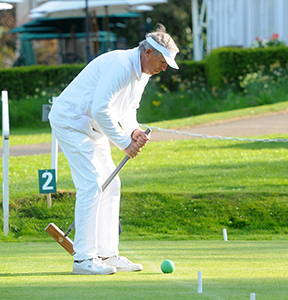 He kept up his croquet and was also a member of the Jazz section. Dennis' funeral will be hald at 1215, Thursday 1 June at Reading Crematorium, and thenafterwards tin the Thames Room at Phyllis Court. Robin Coates is the 'man of the moment' because his win over Rosemary Noel-Clarke in the 7+ Singles earned him a handicap drop to 8. This comes on the back of victories in his debut performances in the GC 'C' team and the AC 'Handicap' team. 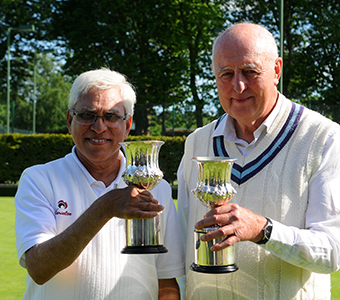 Raghu Iyer was rightly all smiles when he teamed up with former PCC croquet Chairman Harry Midgley to win the Handicap Doubles at Roehampton today. This was his first tournament win away from Phyllis Court, so it was a 'special one'. 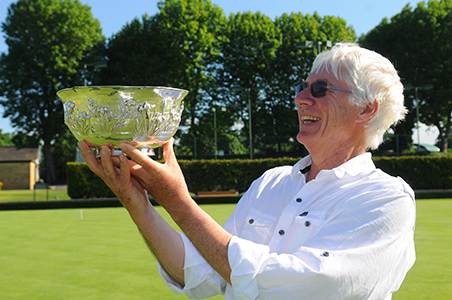 The pair won all five of their games to lift (all be it only temporarily) two lovely matching silver chalices, which were actually previously won by Frances Colman and Chris Roberts (also in this field) in their first 'outside' AC tournament in 2011. Richard Peperell was unstoppable over the past two days and emerged unscathed with five wins out of of five to win the Roehampton Handicap Singles today. He had a close run this in the defacto final of he Swiss style event, winning by two hoops only. 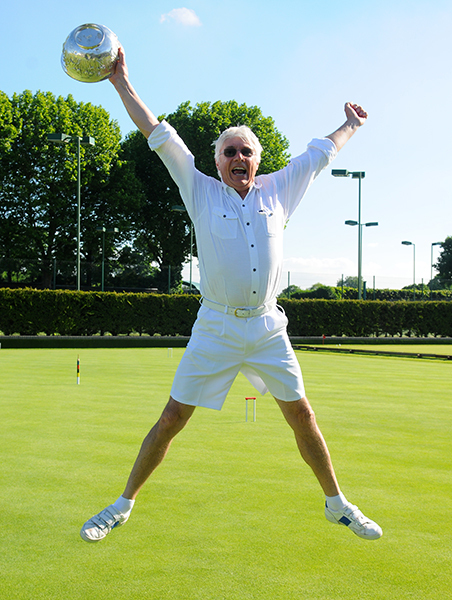 Upon receiving a very decorative silver bowl, Peperell did his trademark star jump of joy! Frances Colman and Chris Roberts were also in the field and both recorded a 3/5 end tally and the former was delighted to sign-off Peperell's AC handicap card after his second handicap drop in as many weeks - he is now down to 11. Helena Fensome is in Spain this long weekend playing in the GC European Championships. You can follow her results in 'real time' via this link but be aware that she plays under her maiden name 'Helena Jansson'. Helena Fensome (playing as 'Helena Jansson') won just twice in a 14 game block stage in Spain. She missed 'the cut' to the Championship knock-out but competed in the plate event.winning 3 games from 6. Chris Roberts represented Oxfordshire in the AC Inter-counties Championship at Southwick (near Brighton) and Compton (Eastbourne) for the past four days. Oxon. finished mid-table in the second division with 5 wins in their 10 matches. Phyllis Court 'B' Recorded a hard fought 7-5 win over visiting Wingrave today. Although ahead throughout, the 'B' were nearly overhauled in he last round when, with the match seriously over-running on time, Peter Haydon had to conceded his last game to meet an appointment in London. Colin Morgan and Mary Gaynor both lost their last games leaving captain Raymond Wood to fight-out the fixture with some 13th hoop drama. PCC 'B' - Peter Haydon, Raymond Wood (c), Colin Morgan, Mary Gaynor.